Andrew "Andy" Kubert (/ˈkjuːbərt/; born February 27, 1962) is an American comics artist, son of Joe Kubert, and brother of Adam Kubert, both of whom are also artists, and the uncle of comics editor Katie Kubert. He is a graduate of and an instructor of second-year classes at The Kubert School, founded by his father who also taught there. Andrew Kubert is the son of Muriel (née Fogelson) and Joe Kubert, the latter of whom came from a Jewish family in southeast Poland (now Ukraine). His siblings include a sister, Lisa, and brothers David, Daniel, and Adam. He and his siblings were raised in Dover, New Jersey. He is also the uncle of comics editor Katie Kubert. He graduated from The Kubert School, which was founded by his father in Dover. Andy Kubert started his comics career as a letterer at DC Comics in 1980. His first credited artwork for the company was the story "Old Soldiers Never Die" in Sgt. Rock #393 (Oct. 1984). He later drew Adam Strange and the Batman versus Predator intercompany crossover. He is best known for his work at Marvel Comics, specifically the company's X-Men titles. An occasional cover artist on Uncanny X-Men (drawing the first cover appearance of the character Gambit) and X-Men Classic, Kubert later served as a fill-in penciller for Uncanny X-Men #279-280 and #288 before becoming the regular penciller on X-Men vol. 2 (starting with #14), following Jim Lee's departure from Marvel to form Image Comics. Kubert was one of the artists of the "X-Cutioner's Song" storyline which ran through the X-Men titles in 1992 and drew the wedding of Cyclops and Jean Grey in X-Men #30 (March 1994). Kubert drew the Amazing X-Men limited series as part of the "Age of Apocalypse" storyline in 1995. In 2001, Kubert drew two issues of the new Ultimate X-Men title. With writers Bill Jemas, Joe Quesada and Paul Jenkins, Kubert produced the Origin limited series which revealed the early history of Wolverine. Kubert collaborated with novelist Neil Gaiman on the Marvel 1602 eight-issue limited series published from November 2003 to June 2004. Writer Orson Scott Card and Kubert crafted the Ultimate Iron Man limited series in 2005. Both Kubert and his brother, Adam, signed exclusive contracts to work for DC Comics in 2005. 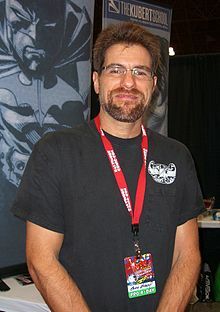 Andy Kubert became the penciller of the Batman series and with writer Grant Morrison introduced the Damian Wayne character. 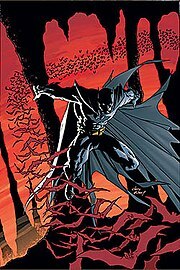 He illustrated the covers to Batman: Cacophony, a three-issue miniseries published in November 2008. Kubert drew the two-issue Batman story by Neil Gaiman entitled, "Whatever Happened to the Caped Crusader?" This reunited Gaiman and Kubert, who previously worked together on the series Marvel 1602. While his brother Adam has returned to Marvel Comics following his three-year deal with DC, Dan DiDio confirmed in 2009 that following "Whatever Happened to the Caped Crusader? ", Kubert had two more Batman projects in the works, one of which he would write himself. He contributed covers to the Blackest Night: Batman mini-series, as well as variant covers for "Blackest Night" issues of Green Lantern. In late 2009, DC announced that Andy Kubert was working on two DC stories, one featuring Batman, the other featuring the DCU. Kubert's father Joe inked over his pencils on the first two issues of DC Universe: Legacies, a 10 issue series chronicling the history of the DC Universe. Andy Kubert contributed to Batman #700, teaming again with Grant Morrison to tell another tale of Damian Wayne as Batman in the future as part of the oversized anniversary issue. In 2011 Kubert illustrated the DC miniseries Flashpoint. In 2013 Kubert wrote and drew Damian: Son of the Batman, a four-issue mini series about Robin in an alternate future. Kubert was one of the artists on The Dark Knight III: The Master Race which was co-written by Frank Miller and Brian Azzarello. As of 2018, Kubert is collaborating with writer Scott Snyder on the New Challengers, part of the Dark Metal project. Kubert and his brother Adam teach at their family business and alma mater, the Joe Kubert School. Artwork for the cover of Batman #655 (Sept. 2006), the first issue of "Batman and Son"
^ a b "Kubert, Joe, 1926-". HighBeam Research. n.d. Archived from the original on May 17, 2013. Retrieved August 13, 2012. ^ Meth, Clifford (June 4, 2005). "Joe Kubert: From Shtetl to Grand Master - Part One". "Meth Addict" (column), ComicsBulletin.com. Archived from the original on August 20, 2008. ^ Jennings, Dana (December 14, 2003). "Paper, Pencil And a Dream". The New York Times. Archived from the original on May 21, 2013. Retrieved March 29, 2012. Mr. Kubert said that Dover, which has 18,000 people and is bisected by the Rockaway River, suits him. He and his wife, Muriel, raised their five children here, and it was here that they opened their school. ^ a b "Andy Kubert, Illustrator, Cartoonist and VP". The Kubert School. n.d. Archived from the original on January 11, 2014. Retrieved August 13, 2012. ^ Manning "1990s" in Gilbert (2008), p. 269: "X-Men founders Scott Summers and Jean Grey finally got hitched thanks to writer Fabian Nicieza and artist Andy Kubert." ^ Manning "2000s" in Gilbert (2008), p. 307: "[Joe] Quesada, along with writer Bill Jemas, scripter Paul Jenkins, and artist Andy Kubert, decided to [reveal the history] with Origin, a six-issue miniseries." ^ Manning "2000s" in Gilbert (2008), p. 317: "Neil Gaiman...took his creative vision and penchant for times past to Marvel, crafting this eight-issue limited series alongside fan-favorite artist Andy Kubert. Digitally painted by Richard Isanove...this series took an alternative look at what the classic Marvel pantheon would be like if they had existed in the 17th century." ^ Manning "2000s" in Gilbert (2008), p. 325: "Acclaimed sci-fi novelist Orson Scott Card, with Marvel artists Andy Kubert and Mark Bagley delved into Tony Stark's past in the five-issue miniseries Ultimate Iron Man." ^ Cowsill, Alan "2000s" in Dolan, p. 326: "The story not only brought Talia al Ghul back into Bruce Wayne's life but also introduced a major new character: Damian Wayne, Batman's son...Andy Kubert provided some of the most dramatic and atmospheric art of his distinguished career in 'Batman and Son'." ^ "Batman: Cacophony - November 12th!". News Askew. August 20, 2008. Archived from the original on November 20, 2008. Retrieved June 8, 2012. ^ Cowsill "2000s" in Dolan, p. 337: "Writer Neil Gaiman and art legend Andy Kubert teamed up to present a touching imaginary tale of a wake for the dead Batman...A love song to the Dark Knight's long history...it went on to win SFX's Best Comic award in 2010." ^ "SDCC 08: Neil Gaiman and Andy Kubert on Batman". Geeks of Doom. July 27, 2008. Archived from the original on September 18, 2016. ^ Brady, Matt (February 25, 2009). "Dan DiDio: 20 Answers, 1 Question - 02.25.09". Newsarama. Archived from the original on July 29, 2013. Retrieved June 8, 2012. ^ Rogers, Vaneta (November 9, 2009). "10 Answers and 1 Question w/ DC's Dan DiDio". Newsarama. Archived from the original on January 12, 2014. ^ Renaud, Jeffrey (December 11, 2009). "Wein Explores DC's History in Legacies". Comic Book Resources. Archived from the original on August 26, 2013. Retrieved January 4, 2014. An all-star cast of artists will collaborate on Legacies, which is slated for a launch in May 2010, and kicking things off for the Golden Age arc is the father and son duo of Joe and Andy Kubert. ^ Simpson, Benjamin (April 14, 2010). "Flashpoint Coming in 2011 From Geoff Johns and Andy Kubert". iFanboy. Archived from the original on January 4, 2014. ^ Johnston, Rich (April 20, 2010). "Why Flashpoint Won't Be Late". Bleeding Cool. Archived from the original on January 4, 2014. ^ Damore, Meagan (November 1, 2013). "Damian: Son of Batman #1". Comic Book Resources. Archived from the original on January 4, 2014. ^ Holub, Christian (April 20, 2017). "DC Comics superstars unite for new Dark Matter line". Entertainment Weekly. Archived from the original on July 1, 2017. The final book in the line, New Challengers, debuts in December and will be written by Snyder with art by Andy Kubert. ^ Baily, Benjamin (April 20, 2017). "Andy Kubert Talks DC's Dark Matter and New Challengers (Exclusive)". The Nerdist Podcast. Archived from the original on June 16, 2017. Of the all awesome series announced, we’re most excited about New Challengers by Snyder and legendary artist Andy Kubert. Wikimedia Commons has media related to Andy Kubert.